Chevron Corp. said Thursday it has restarted its largest refinery that was shut down by Hurricane Katrina. The refinery in Pascagoula, Miss., processes an average 325,000 barrels of crude oil a day, as well as producing 5 million gallons of gasoline. San Ramon-based Chevron shut the refinery down shortly before Katrina hit. The hurricane damaged the refinery's marine terminal, cooling towers and other equipment. "Safely restarting the Pascagoula Refinery is another terrific achievement of our employees in the Gulf Region, many of whom have had to overcome personal adversity to help us resume operations," said Jeet Bindra, the president of Chevron Global Refining. State says Shell, Amerada Hess, Sunoco overpriced gasoline after Katrina shut down Gulf production. NEW YORK (Reuters) - New Jersey's Acting Gov. Richard Codey said Monday the state had sued Motiva Shell, Amerada Hess and Sunoco for overpricing gasoline after Hurricane Katrina shut much of the Gulf's oil production and damaged refineries. New Jersey motorists paid an average of $2.87 a gallon on Monday, according to the American Automobile Association. State law bars gasoline stations from raising prices more than once every 24 hours, but Codey said multiple price changes had occurred within that period. Major pipeline that distributes gasoline to the Eastern United States is running at full capacity. NEW YORK (CNN/Money) - A major pipeline supplying refined crude products from the Gulf to the East Coast is now running at full capacity and is delivering into all locations along its system. The Colonial Pipeline, based in Alpharetta, Ga., returned to full operating conditions late Monday and full commercial electrical power has been restored to the pipeline, the company said in a statement. Colonial Pipeline was one of two pipelines taken off-line by power outages caused by Hurricane Katrina last week. The shutdown backlogged the distribution of gasoline supplies and sent prices surging on worries of a shortage. Colonial, which consists of more than 5,500 miles of pipeline, delivers a daily average of 100 million gallons of gasoline, home heating oil, aviation fuel and other refined petroleum products to key terminals and distribution centers along the Eastern seaboard. 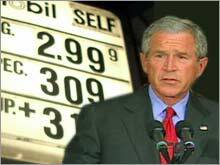 Bush expresses 'zero tolerance' of price gouging in interview as prices spike above $3 a gallon. WASHINGTON (Reuters) - President Bush warned Thursday against price-gouging of gasoline in the aftermath of Hurricane Katrina and said looters should be treated with zero tolerance. "I think there ought to be zero tolerance of people breaking the law during an emergency such as this, whether it be looting, or price-gouging at the gasoline pump or taking advantage of charitable giving, or insurance fraud," Bush said in an interview on ABC's "Good Morning America." Gasoline sellers have been fast to raise prices in the wake of the storm. Prices have risen above $3 a gallon and in some places are higher because of a sudden drop in oil supplies. Bush said Americans should conserve more gasoline in response to the crisis and said he expected Saudi Arabia to do "everything they can" to provide more oil. He said eight refineries are down in the Gulf and "it's going to take a while" to get them going again. Soaring prices, long lines and outright shortages returned to Atlanta gas stations Wednesday for the first time since the 1970s. Although both major gasoline pipelines serving the area resumed limited pumping Wednesday evening, many consumers already had reacted to widespread uncertainty and panicked. Afraid there would be no gas over the holiday weekend, motorists got in line to pay historically high prices. The threat of shortages came from hurricane-damaged refineries and pipelines without full power to pump. How much consumers compounded the problem wasn't clear. "Atlanta's not out of gas," said Jim Tudor, president of the Georgia Association of Convenience Stores. Some stations might be out, "but it wasn't because there wasn't gas available. It was because there was a run on these stores." Still, the hurricane's impact hit at a bad moment — when gas inventories were already low. Shortages were threatened throughout the Southeast in the aftermath of Katrina and prices reflected that. Late Wednesday, Gov. Sonny Perdue declared a state of emergency and threatened to impose heavy fines on gasoline retailers who overcharged Georgia drivers. There is "credible evidence" of price-gouging, he said. "When you prey upon the fears and the paranoia, it is akin to looting, and it is abominable," Perdue said at a hastily called news conference. "I'm frankly embarrassed for our state and some of our businesses that we have to do this." From late morning to early afternoon, the highest area price for regular doubled briefly from about $2.70 a gallon to more than $5 a gallon. 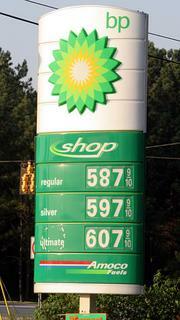 A BP station in McDonough hit $5.87, according to AtlantaGasPrices.com. Four dollars a gallon became common. There were numerous reports late Wednesday of stations' closing, or shutting down their pumps. Some stations capped purchases. At a Midtown Chevron that announced a 10-gallon limit on purchases "due to the fuel shortage," Tim Gara pumped gas into his Toyota. "I knew it would be a problem with the hurricane. I didn't know it'd get to rationing." Throughout the day, speculation zipped across airwaves and the Internet, via text messages and over phone lines. Rumors simmered around office water coolers, fueling the panic. One said state police were closing all gas stations at 4 p.m.; they didn't. Wednesday afternoon, the governor and AAA told consumers not to panic. "Don't go out and top off your tank," Perdue said. At the same time, he also urged people to telecommute and discouraged unnecessary driving on the eve of one of the biggest travel weekends of the year. The governor urged calm and expressed faith in market-regulated prices. Four and a half hours later, he declared a state of emergency. Others, including the auto club, advised sticking with travel plans. Barbara Washington of Atlanta struggled with the confusing advice. She had planned to drive to Jackson, Miss., to check on her elderly parents. "Do I risk it, or do I just stay put? What do I do?" Now she plans to fly. Even the experts didn't have answers. "I don't want to scare the public to death, because I don't have a crystal ball," said Roger T. Lane, president of the Georgia Oilmen's Association, which represents distributors. "Gasoline is in tight supply." So in a distant echo of the 1970s, consumers were unwilling to gamble on sufficient supplies. Queues formed — and tempers flared. Tammy Crowe of Dallas was waiting in line at a gas station in Lithia Springs when she saw another motorist pull a gun. People had been waiting for a half-hour and were edgy when a man in a bronze car cut off a motorcyclist, Crowe said. " 'Hey, wait a minute. I've been waiting here,' " the motorcyclist admonished the line-breaker, Crowe said. The two men began arguing. Then the man in the car pulled a handgun out of his pocket, Crowe said. "It was big." A gas station employee yelled, "You want to go to jail?" and pulled out a cellphone. The man put the weapon away and said he wanted to get back in line. "No," the employee said. "Leave." He did. Crowe heard a woman who was waiting say, "It ain't worth my life to get gas. We just need to pray." There were at least two pieces of good news. In an unprecedented action, the U.S. Environmental Protection Agency waived pollution-reduction rules for gas in all 50 states. And by evening, both major gasoline pipelines to Atlanta were pumping again. Alpharetta-based Colonial Pipeline Co. was pumping at 25 percent to 35 percent of capacity. Plantation Pipe Line Co. also started pumping at 25 percent. The pipelines had gone down when they lost electrical power at pumping stations hit by the hurricane. Getting the flow back up to speed is critical, said Jonathan Cogan, spokesman for the Energy Information Administration. "This has affected everywhere along the chain, from the product to consumers. It doesn't look good." The start-up by Colonial might seem modest, but it may help cushion the area from the worst effects, said James Williams, chief economist of WTRG, an energy consulting company. "This will go a long way toward getting things back to normal," he said. "It's like one lane that gets started after an accident closed all four." Of course, a working pipeline is pointless without a product to pump — and many of the Gulf's refineries still are not working. But as the storm cleanup continues, many should be able to pump out the product they had produced before the hurricane, Williams said. "We don't anticipate running out," said Michael Barrett, a spokesman for California-based Chevron. "There is enough gasoline coming into the market" from storage tanks in the meantime. Metro Atlantans found small ways to cope. MARTA ridership was up, officials said. Georgia State Patrol troopers were asked to cut their driving by 25 percent. And consumers hit a gas price Web site so hard that AtlantaGasPrices.com was often too clogged to access. To Atlantans fretting about a weekend trip, the AAA offered reassurance. "As long as you are on the interstate system, we don't think you will have any problems getting gasoline," said Gregg Laskoski, AAA spokesman. "We are not aware of any reason for people to cancel their travel plans."